Never be caught without your trusty PakLite with this handy case. 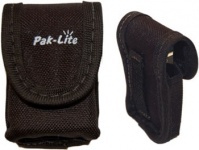 Designed especially for PakLite flashlights, this simple case threads onto your belt to keep your PakLite handy all the time. The Pak-Lite series of torches is deployed in all US Military survival kits and provides exceptionally long lasting run time due to its unique 9VOLT design. This PakLite is an excellent trail light. Brighter than the white LEDs, this flashlight will cast a beam that will light your path and then some. The Pak-Lite series of torches is deployed in all US Military survival kits and provides exceptionally long lasting run time due to its unique 9VOLT design. This Pak-Lite uses two red LED bulbs which provide enough light to walk by, yet will not hinder your night vision. The Pak-Lite series of torches is deployed in all US Military survival kits and provides exceptionally long lasting run time due to its unique 9VOLT design. 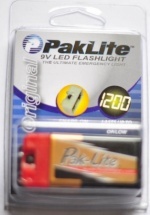 White LEDs are the best choice for a general purpose flashlight, and they also work great for reading, walking, viewing maps, night-light in hotel rooms when traveling abroad, etc...The PakLite Super snaps to the top of any 9v battery and can burn for up to 600 hours on the soft mode! Want value-for-money? This is it! The plastic cap also glows in the dark aiding you in locating your PakLite at night.Makes a great addition to any glove-box, survival kit, camping kit or a gift for your adventurous friends. The Pak-Lite series of torches is deployed in all US Military survival kits and provides exceptionally long lasting run time due to its unique 9VOLT design. 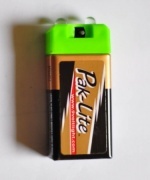 White LEDs are the best choice for a general purpose flashlight, and they also work great for reading, walking, viewing maps, night-light in hotel rooms when traveling abroad, etc...The PakLite Super snaps to the top of any 9v battery and can burn for up to 600 hours on the soft mode! Want value-for-money? This is it! The plastic cap also glows in the dark aiding you in locating your PakLite at night. 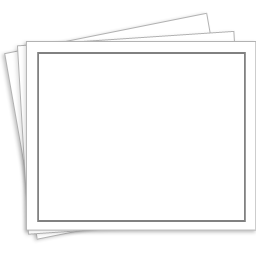 Makes a great addition to any glove-box, survival kit, camping kit or a gift for your adventurous friends.